New York: Dover, 1980 280 pp. Quarto. Wear and soiling to corners, bow to front wrap. A few analytic notes in pencil made by Saul Novack, a colleague of Felix Salzer who was responsible for bringing him to Queens College and wrote the article about Salzer in the New Grove. 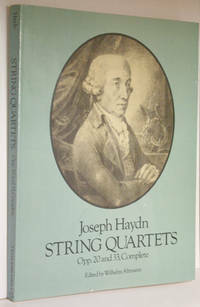 Unabridged republication of 12 separate quartet vols. 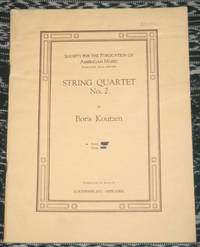 as published by Eulenburg. edited by Wilhelm Altmann.. Wraps. Good. 4to - over 9¾" - 12" tall. 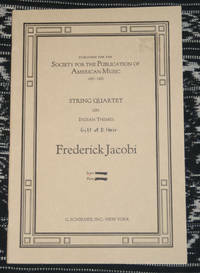 New York: Schirmer, 1974 xiii, 417 pp. Probable first. Printed and bound in Great Britain. DJ sunned, with tears ,folds, mostly present. Cloth stained at foot, but no evidence of moisture in text block, which is clean and white, vg or better. Contents: 1. Beginnings; 2. 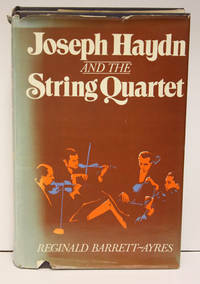 The early quartets; 3. The contemporary scene; 4. 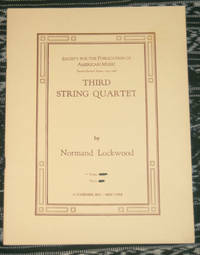 Investigatin Opus 3; Form and Technique in Opus 9; 6. 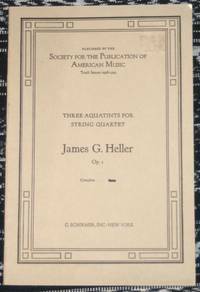 Quartet and symphony: The emergence of a chamber style; 7. The sonata principal in Opus 17 and Opus 20; 8. 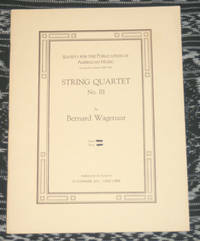 Fugue in Opus 20 and in contemporary string quartets; 9. The early quarrtets of Mozart; 10. A new and special way, Opus 33; 11. Odds and Ends; 12. 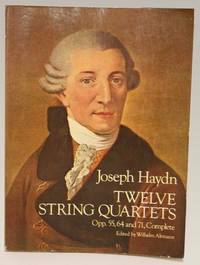 Mozart: The six quartets dedicated to Haydn; 13. Monothematicism, Opus 50; 14. Early sources and autographs; 15. 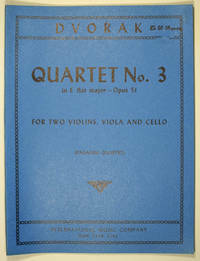 The Tost quartets: Opus 54 and Opus 55; 16. The end of an era, Opus 64; 17. Mozart: Sublime or in decline? ; 18. Towards romanticism: Opus 71 and Opus 74; 19. The harvest: Opus 76; 20. The Viennese classical school; 21. The consummation: Opus 77 and Opus 103; 22. Theme and variations; 23. Beethoven; 24. Conclusion.. Cloth. Good/Fair. 8vo - over 7¾" - 9¾" tall. New York: Dover, 1985 262, 24 pp. General wear to wraps, inside fine. Edited by Wilhelm Altmann. Reprints of works originally published in London by Ernst Eulenburg. 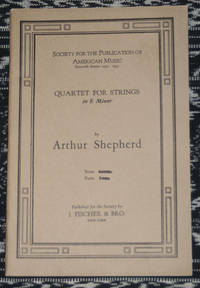 Contents: Opus 20. No. 1, in E-flat major; No. 2, in C major; No. 3, in G minor; No. 4, in D major; No. 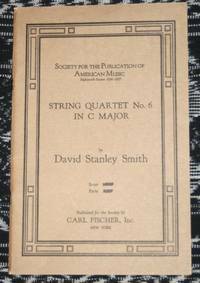 5, in F minor; No. 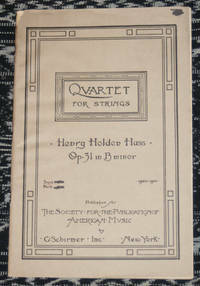 6, in A major; Opus 33. No. 1, in B minor; No. 2, in E-flat major ("The joke"); No. 3, in C major ("The bird"); No. 4, in B-flat major; No. 5, in G major; No. 6, in D major. . Wraps. Good. 4to - over 9¾" - 12" tall. New York: International, 1950. 13, 11, 10 pp. Parts. Lacking viola part. Previous owner's stamp on all materials, else fine.Edited by Adolphe Frezin of the Paganini Quartet. . Wraps. Very Good. 4to - over 9¾" - 12" tall.